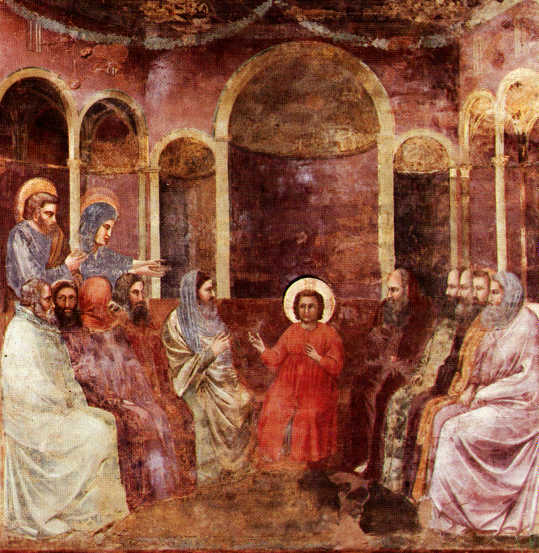 “Jesus among the doctors of the church,” Scrovegni Chapel, Padua, Giotto. A sermon for the Fourteenth Sunday after Pentecost, August 30, 2015. The lectionary readings are Deuteronomy 4:1-2, 6-9, Psalm 15, James 1:17-27, and Mark 7:1-8, 14-15, 21-23. Jesus is dealing with the dedicated religious of his day, the Pharisees and the scribes. The scribes preserve the Law of God. Form is their business, and had it not been for the scribes, much of the tradition would have been lost. The scribes are the memory, the archives, and the tradition of the Jewish faith. I have a colleague who simply cannot worship in a church that is not his own, usually with him at the altar. I used to sit with him at diocesan events or at some special occasion at another church. As he fidgeted and muttered under his breath, wrote notes to himself, and shook his head, I used to get angry—frustrated at trying to fix the uneasy situation. But these days I simply avoid sitting near him. It doesn’t make me angry, but it does make me sad. He’s missing so much. Of course people do silly things in worship, but that’s not the point, is it? So often when we read about Jesus criticizing others, we can read it as anger. Sometimes it is, but more often than not, I think we’re reading Jesus’s sadness. He’s sad that we don’t get is so often. He’s sad that we limit God’s love and grace. Christ is sad whenever we miss the opportunity to receive all the good and love God would give us. It’s easy to get caught up in all the details—for the Pharisees it might have been the washing of hands in just the right way, at just the right time. For us, who knows what it is. I know that newcomers are sometimes frustrated when they see people kneeling and crossing themselves and bowing at the name of Jesus, and they aren’t sure what the code is, or how they gain access to this seemingly secret language of gesture. And while most of us have some reason for what we do—we were taught it, we’ve developed it as a helpful reminder of an embodied faith, we’ve read about it—all sorts of reasons—- I hope newcomers and old-timers alike will know in their hearts that such things are the least important.